Shimul Yusuf gave a laudable performance as Binodini. A poster of the actress at the four-day festival. 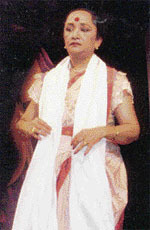 Nati Binodini (Bengali) was based on Brajendra Kumar Dey’s jatra-play. Truth is indeed stranger than fiction. So was the life of Binodini Dasi (1863-1941), a prostitute-turned-actress who dominated the Kolkata stage for a little more than a decade. She flowered into a versatile actress-star under the able guidance of none other than Natasamrat Girish Chandra Ghosh (1844-1912). In the prime of her career, Binodini quit the stage to settle down to domesticity. But her happiness was shortlived because she lost her daughter Shakuntala when the little girl was only 11, the same age that Binodini was when she stepped on the stage for the first time as an extra. Why did she quit? The answer to this can be found in the two autobiographies she penned. One is Aamar Katha (My Life) and the other is Aamar Abhinetri Jeebon (My Life in Theatre). Rimli Bhattacharya translated these into English and Kali for Women published them. Academy Theatre, an organisation founded in 1984 and dedicated to theatre research, held an entire theatre festival on this great actress. The four-day festival, titled Bangarangamancher Binodini, was held at Kolkata’s G.D. Birla Sabhagriha in the first week of November. Three theatre groups presented three plays on the life of Binodini, better known as Nati Binodini. The prefix ‘nati’ was added to celebrate her talent and versatility as an actress par excellence. A musical concert threaded together by a lucid narration by Soumitra Chatterjee, with songs clubbed under the title Binodini-Kaaler Natya-Sangeet, sung by Devajit and Riddhi Bandopadhyay with their eight-year-old son Riddhodeb on the tabla, held the audience enthralled on the last evening. Devajit, a theatre scholar, is the founder of Academy Theatre. The festival opened with Nati Binodini (Hindi) by Theatre and Television Associates of Delhi. Directed by Amal Allana, it was a radical departure from the norm that presented not one but five different actresses playing Binodini on the stage at the same time. One of them was the old and doddering Binodini in the ‘present’, while the others — part of the flashback — appeared while she was writing her autobiographies. The four wore identical costumes and make-up, representing different ages and phases the girl went through till she flowered into an actress and then left the stage. It was a brilliantly structured play with a split-level set and mood lighting, embellished by fine acting and music. But, the over-weepy old Binodini took away from the character the strength she was known for. The second day’s play, Nati Binodini (Bengali), by Kolkata’s Bharattirtha Jatra Samaj, was based on Brajendra Kumar Dey’s jatra-play. 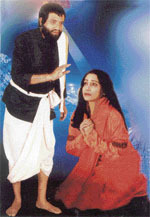 Halfway through, the play unfolded the transformation of Binodini from the evening Sri Sri Ramakrishna Paramahansa walked up to the stage after she had performed the title role in Sri Chaitanya and blessed her. The play offered a complete rendering of Binodini’s entire life from the time she was forced to become the mistress of a much older man by her mother till the time her husband died leaving her a life of loneliness and isolation. The music, lyrics and rendering of the songs by Tapasi Roy Choudhury were outstanding. The same goes for the entire acting cast, with special emphasis on the actor who played Sri Sri Ramakrishna Paramahansa. But Tapasi as Binodini failed to deliver. Her costumes, make-up, body language, were too contemporary and sophisticated to fit into a period character. Comic interludes to accommodate costume changes were the other reason for the play’s failure. Dhaka Theatre of Bangladesh presented Binodini in Bengali, scripted solely on the original Bengali versions of the actress’s two autobiographies. It was a one-woman performance by Shimul Yusuf. And what a performance! The woman danced, pranced, sang, acted, laughed, cried, read out, recited, expressed, interacted, and invested the character of Binodini with a dignity the earlier two plays had failed to do. Binodini had quit the stage because she was disillusioned with the way her life on stage had turned out. When the theatre group she belonged to ran into bad weather and the proprietor decided to close it down, Binodini was persuaded to make the greatest sacrifice. Her mentor and guru Girish Chandra Ghosh persuaded her to become the mistress of a wealthy fan, a Marwari businessman named Gurmukh Rai, to save the theatre from utter ruin. She agreed on condition that Rai would build a theatre house for the group. Rai built the theatre and asked Girish Chandra Ghosh to call it "B-Theatre", after the first letter of Binodini’s name. But it was registered as "Star" theatre instead because any theatre named after a ‘fallen woman’, they felt, would fail to draw an audience. Ironically, years later, a bulldozer mowed down the theatre in order to widen Beadon Street, where it stood. The Star theatre that stands in Kolkata today is not the original one. Shimul Yusuf proved with her wonderful one-woman performance that it was possible to bring alive Binodini through a play on her life, with reverence and with a sense of history.